State Examination Board (SEB) of Gujarat has announced the Gujarat TAT Result 2018 on December 04, 2018. The Result has been declared through online mode only. Result is displayed on the official website that is ojas.gujarat.gov.in, sebgujarat.com. After successfully conducting the Gujarat TAT 2018 exam, SEB has released the Gujarat TAT Result 2018. Before the announcement of final result, Answer Key is issued on the official website. Candidates had already got an estimation of their probable score for Gujarat TAT Result 2018 through the Answer Key. The Result for Gujarat TAT 2018 contains status of qualifying or not qualifying the exam. 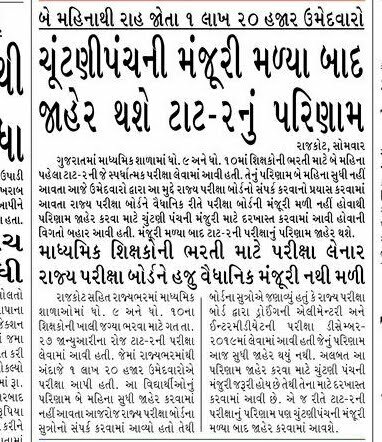 With the help of this article, applicants will be able to gain all the necessary information about the Result of Gujarat TAT 2018. Result for Gujarat TAT 2018 are announced on the official website. Candidates can check the below schedule for Gujarat TAT Result 2018.